Canada's economic output as measured by gross domestic product was $1.76 trillion in 2017. This was just one tenth that of its primary trading partner, the United States ($19.3 trillion) and slightly less than its other NAFTA partner, Mexico ($2.4 trillion). Canada’s 2017 GDP growth rate was 3.0 percent, faster than both the United States (2.2 percent) and Mexico (2.1 percent). Canada's standard of living, as measured by GDP per capita, was $48,100. That's lower than the United States ($59,500) but higher than Mexico ($19,500). Canada is roughly the same size as the United States (3.8 million square miles), but only has 1/10 the people (34.6 million). It's three times the size of Mexico, with one-third the people. Why is Canada so sparsely populated? Climate. Its northern half is so cold for so much of the year that the ground remains permanently frozen. As a result, 90 percent of the people live within 100 miles of the US border. Canada has more fresh water than any other country, with between two to three million lakes. Most of it cannot be used for productive uses, such as hydropower or even irrigation. Almost 50 percent of Canada's land is locked up in permafrost. Only 4.3 percent of Canada's land is suitable for farming, compared to 16.9 percent of land in the U.S., and 12.9 percent in Mexico. On April 24, 2017, the Trump administration warned it may impose a 20 percent tariff on Canadian lumber. That would affect $10 billion in exports. Western provinces allow loggers to cut trees on government-owned land. The U.S. Commerce Department says the reduced rates allow for trade dumping. The threat alone has reduced imports of Canadian softwood lumber. The tariff would be retroactive. Many companies hesitate to purchase lumber that could face a 20 percent surcharge. The Commerce Department must prove to the U.S. International Trade Commission that Canada's actions injure the American lumber industry. In 2004, a NAFTA panel said the United States did not prove the dumping had harmed the American lumber industry. Trump also withdrew the United States from the Trans-Pacific Partnership. Trudeau and the other signatories are moving forward with the agreement, even without the United States. Canada is the 12th largest exporter in the world. In 2017, it exported $433 billion. Three-fourths of this goes to the United States. Trade with the United States and Mexico has tripled since 1994, thanks to NAFTA. Canada is America's largest supplier of energy. That includes oil, gas, uranium and electric power. Canada struggles to overcome another geographic handicap. It doesn't border any countries other than the United States. This makes shipments of goods to other markets more expensive. Canada benefited by the discovery of oil sands in Alberta. That gave it the third largest oil reserves in the world (173.1 billion barrels). It's behind Saudi Arabia and Venezuela. It ranks ninth in the world in recoverable shale oil. It's fifth in shale gas, according to the U.S. Energy Information Administration. Canada is now the fifth largest oil exporter. It ships 1.576 million barrels at day, recently surpassing Mexico. On the other hand, Canada's reliance on oil exports may throw it into a recession. That's because oil prices fell from $100 to $25 a barrel in 2014. Canada's central bank cut interest rates to stimulate the economy, but that may aggravate a housing bubble. The government could spend more, but the debt-to-GDP ratio is already high at 92 percent. That's why Canadians elected Justin Trudeau as the new Prime Minister. 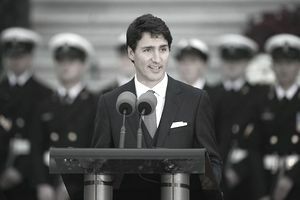 He is the son of charismatic former Prime Minister Pierre Trudeau. His election reflects a demographic shift toward liberalism. The Liberals gained 2.8 million new voters. These are people who didn't vote in 2011 when Canada elected conservative Stephen Harper. Trudeau promised to spend C$60 billion in new infrastructure. This will increase the budget deficit. But that might be paid for with taxes on marijuana, which Trudeau plans to legalize. Trudeau also agreed to cut greenhouse gas emissions. That could reduce oil sands production. It would trigger lawsuits from companies that invested billions in development. Longer growing seasons already allow farmers to grow crops such as corn that they never could before. For example, an acre of farmland in Alberta, Canada, sold five times what it did 10 years ago. Temperatures in the province have warmed by 3.6 degrees F since1950, making the growing season two weeks longer. A 2019 government study found that Canada is warming twice as fast as the rest of the world. It warned of coastal flooding, droughts, and wildfires.